It's been a long, cold winter and a rather slow segue into Spring. Trees and shrubs are hesitant about leafing out. Herbaceous plants are huddled underground. Gardeners are eager for some action. 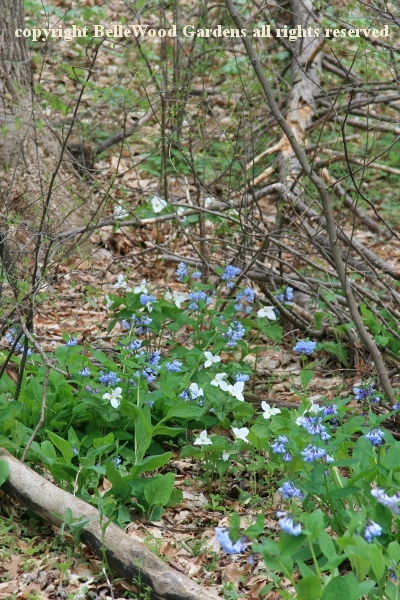 Today's the day the Tohickon Garden Club is out and about for a visit to Bowman's Hill Wildflower Preserve. I had made a previous visit at just about the same time of year, on 20 April 2011. Huddled into our heavy jackets, we divided into two groups, each with a guide, and set off in opposite directions (paths are not especially wide.) Interesting to see what was the same, and what were the differences. The same flowers were in bloom, the weather was distinctly colder, and there were signs of frost damage on some flowers and foliage. 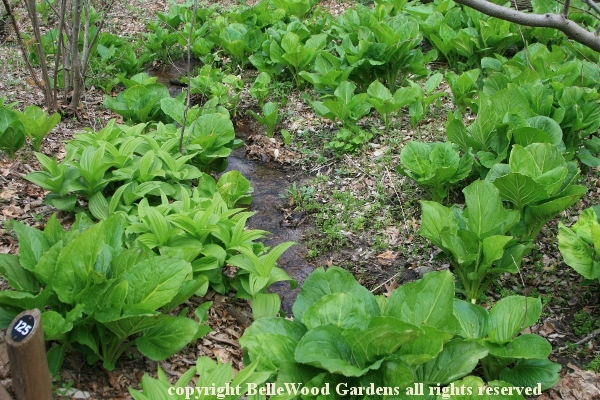 Streamside plants were carpeting the ground along a small rill - skunk cabbage, Symplocarpus foetidus, and false hellebore, Veratrum viride. 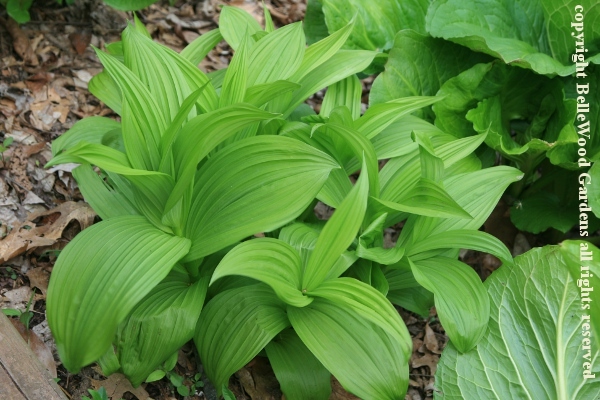 I'm very fond of false hellebore, Veratrum viride, for its beautifully pleated bold foliage. Not easy in cultivation, it dislikes transplanting and demands the particular shade / moisture conditions it would choose for itself. 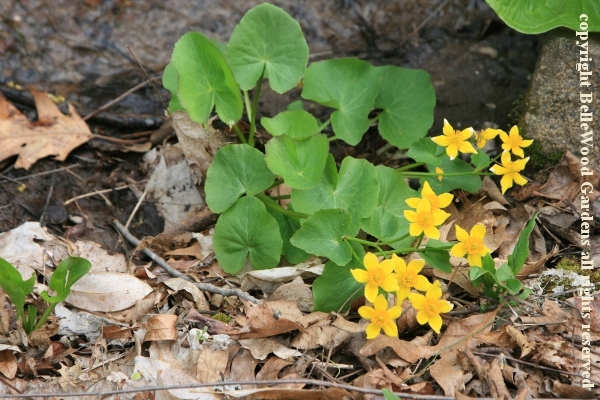 Marsh marigold, Caltha palustris, lends its sunny flowers to a gray and overcast, rather windy day. Palustris is one of those Latin names worth knowing. It means "of swamps, or swampy places," suggesting where such plants are likely to be found. 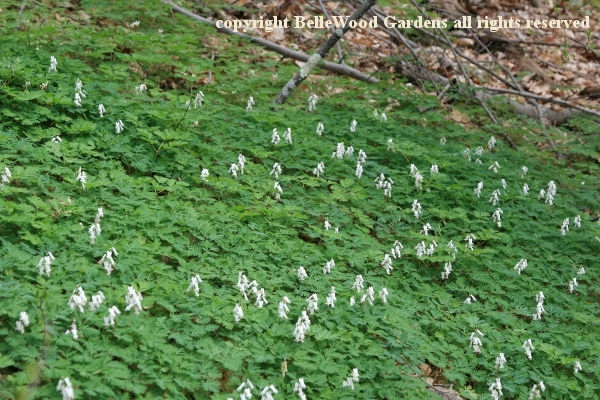 A beautiful hillside of squirrel corn, Dicentra canadensis. It differs from its better known cousin, Dutchman's breeches, D. cucullaria, in two regards. 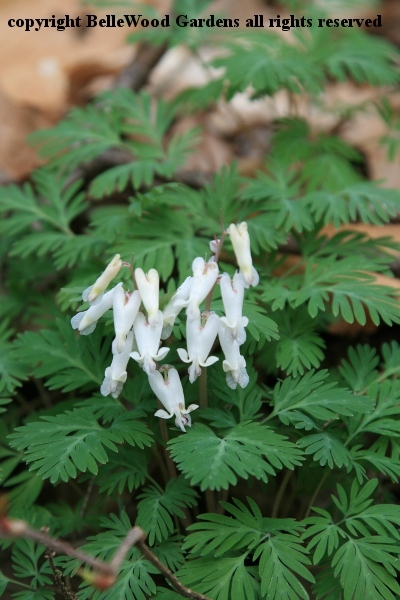 Firstly and more easily observed, the flower of squirrel corn resemble a little white heart-shaped locket. Second, its underground bulb looks like a cluster of yellow corn kernels. Dutchman's breechs has a flower with two little spurs, like a pair of fairy's pants hung up on a line to dry. And its bulb has small white rice-like scales. Be it bulb, corm, or tuber, several of the earlier blooming Spring wildflowers have underground food storage capabilities. This allows them to draw on the reserves when they get growing, rather than rooting around for nutrients in still chilly soil. The previously mentioned dicentra, trillium which we'll soon get, and the Virginia bluebells, Mertensia virginica, with their glaucous leaves and nodding clusters of sky-blue flowers. Ephemeral, they make an appearance, flower, then retreat back underground with summer's arrival. 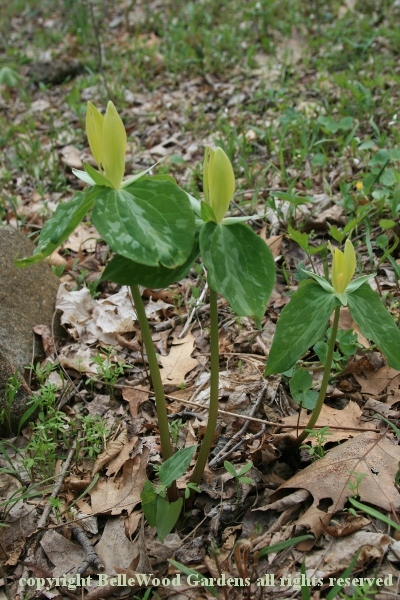 with the white flowers of Trillium grandiflorum. Trillium flexipes from the previous trillium. 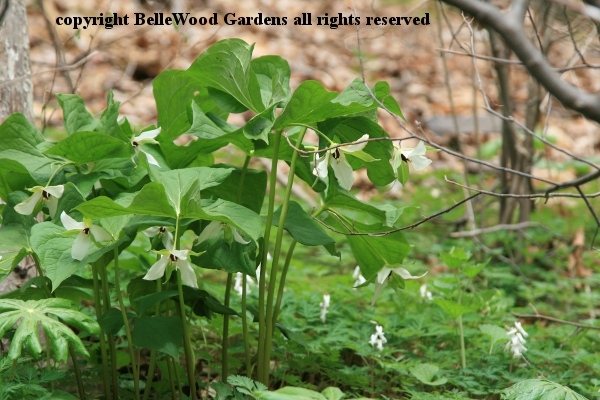 All trilliums have their parts in three - leaves, sepals, and petals. 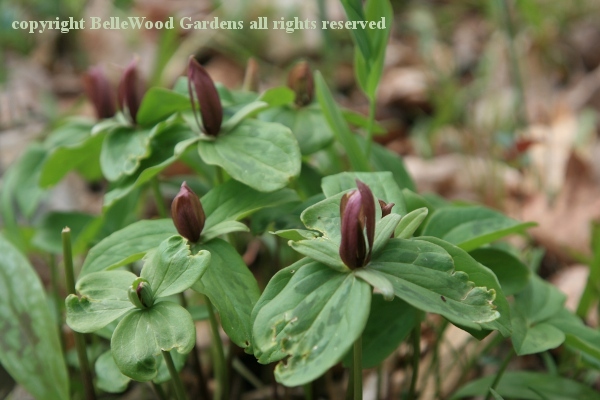 Here in North America we have two different classes of trillium. 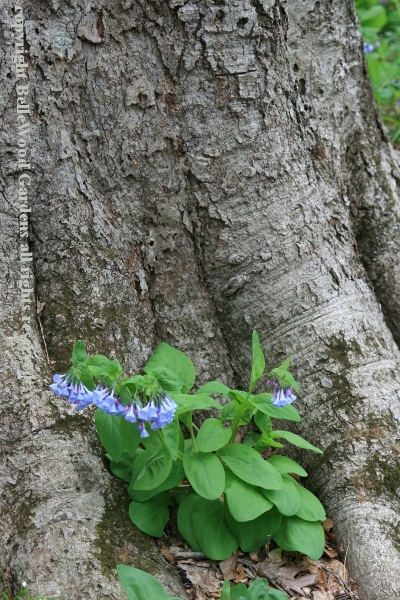 Some, such as T. grandiflorum, T. flexipes and theT. erectum shown above are pedunculate, with a stem-like peduncle between their flowers and the whorl of leaves. The other class are sessile. They lack the peduncle, their leaves are mottled, and their flowers do not open as widely, looking, in fact, more like candle flame. 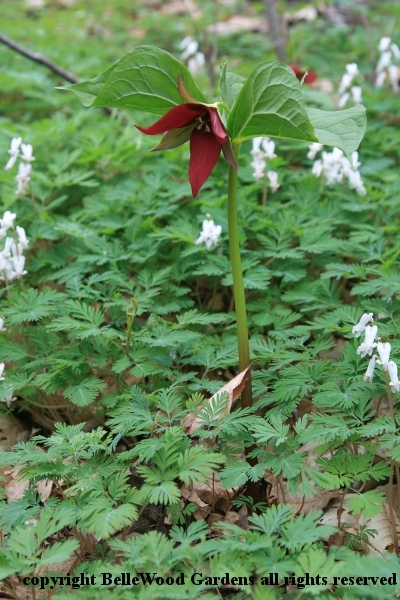 This ox-blood red trillium doesn't look quite like T. cuneatum (a favorite of mine) but perhaps this can be attributed to the frost damage it has clearly suffered. And here is T. luteum, pale chartreuse-y yellow and deliciously scented like lemons. I'll leave you with a conundrum. 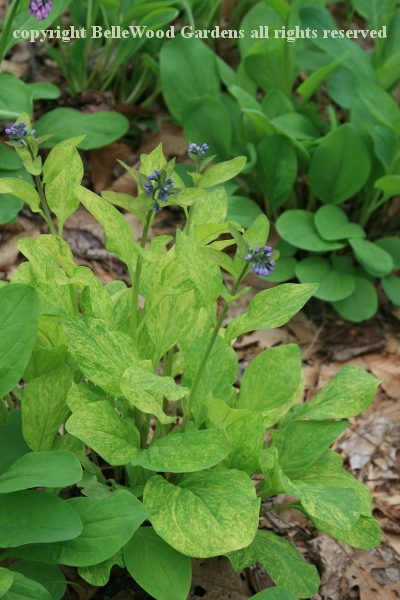 This mertensia with chartreuse variegated leaves: I doubt it is a lack of nutrients, since the other, nearby mertensia have normal foliage. It could be a virus, although the affected plant looks quite healthy. It would be lovely if it is a stable mutation. Anyone have a comment? If so, feel free to contact me and we can discuss the possibilities.